I love Scones. That sentence of course comes with a lot of caveats. They must be made fresh. (don't give me day old) They must be tender. They must be buttery. They must be tasty. 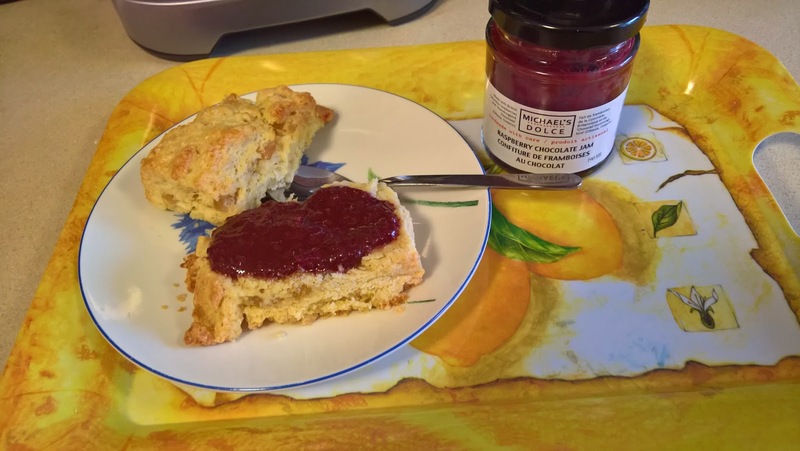 This recipe delivered on all the caveats and the scones were even good the next day, heated up. It did call for making your own candied lemon peel, but there was no way I was going to do that. Funny enough, I chopped up the lemon peel and almost forgot to add it to the dough. D'oh! Thankfully, I was able to fold the dough again and get the peel into it. My go to for excellent scones is my Ovenly Cookbook. I have really learned a lot from them, and feel more confident being able to present good scones consistently. I followed their instructions for bringing the dough together after the kneading. They suggest (after kneading the dough together) to flatten the dough and then fold it, turn a quarter, then flatten again, fold again, turn again, repeat. This step makes for a scone that has lots of tender layers. The scones are absolutely bursting with light flaky layers. I should have made them into smaller scones. They were like the Hulk after being baked!! Next time I will make mini scones. 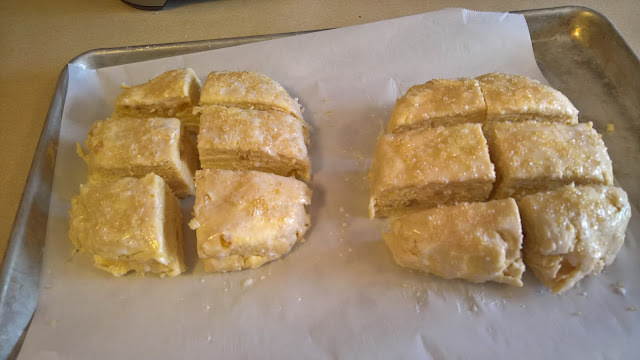 But I do love to see how well they puff up and become light and fluffy. I have had some dense scones in my day and these scones are definitely not dense. 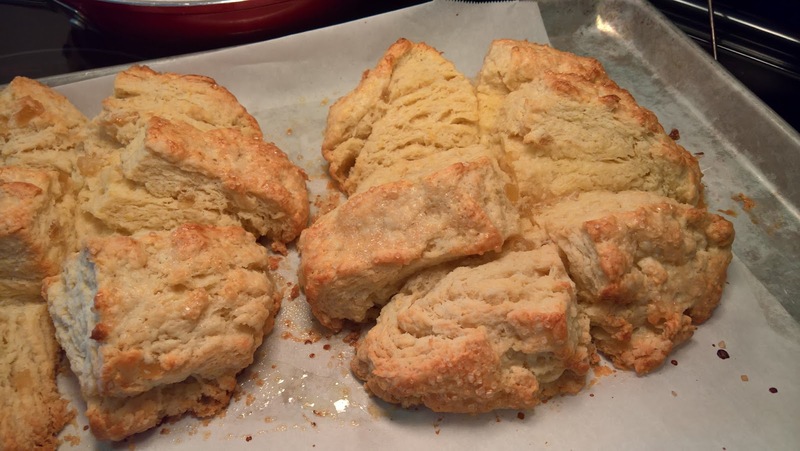 I highly recommend this scone recipe. The flavour of lemon is delicate, and doesn't overpower the scone itself. 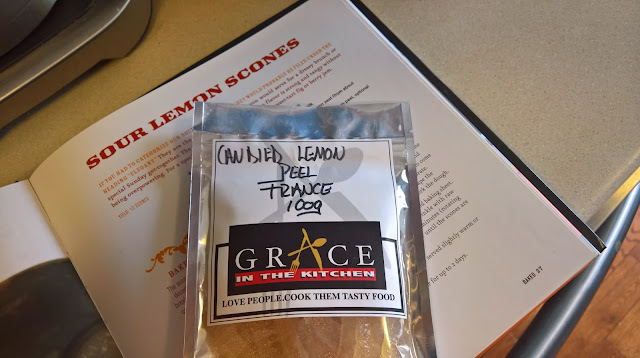 I enjoyed the candied lemon peel in the scone. I think candied ginger would have been nice as well. I will be making these scones again, and not just because I have some candied lemon peel left. For the recipe and to see how the Baked Sunday morning crew liked these scones, head over to Baked Sunday Mornings.